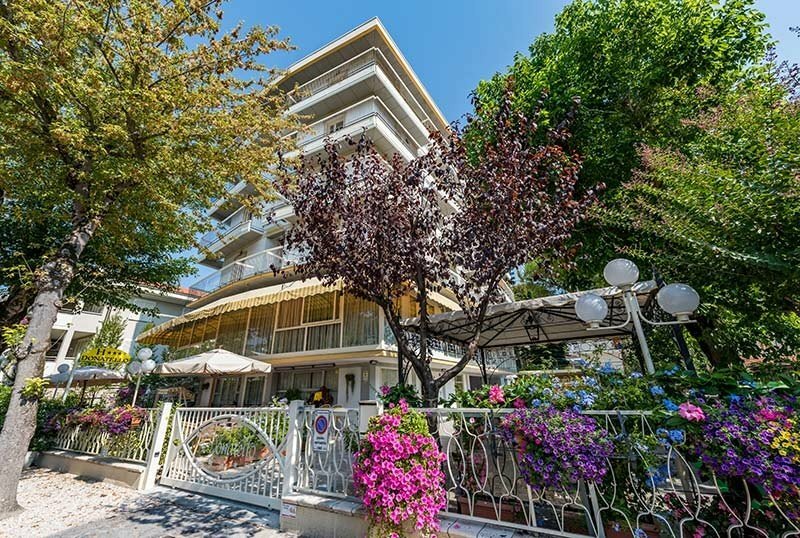 The Hotel Donatello , three stars, offers its guests: parking for cars and motorcycles, WI-FI connection, air conditioning and much more. No pets allowed. The hotel is located in an internal street, less than 5 minutes from the seafront, but in a quiet and peaceful area. The canal and the historical center can be reached with a short walk. The rooms all have a balcony with a clothesline, air conditioning for a fee, satellite TV and digital terrestrial, safe, direct dial telephone and private bathroom with shower, bathtub and hairdryer. Empty mini fridge on request and for a fee. FAMILY: interconnecting rooms with two bathrooms are available on request. Garden, open-air porch, 12 bikes available, reading room with newspapers in consultation, elevator. PARKING: close to the structure, uncovered, available to all customers. AIR CONDITIONING : in the common areas and in the rooms (on payment). SERVICES FOR PEOPLE WITH DISABILITIES : ground floor entrance, standard elevator, room with wheelchair maneuver, wheelchair access shower, shower chair. BREAKFAST : buffet, with croissants, cakes, yogurt, fruit juices, diet products, cold cuts and cheeses. LUNCH AND DINNER : with the full board formula, there are three menus with a choice between meat and fish, buffet of appetizers, vegetables, cheeses and cold cuts. In the hotel: bicycles with child seats, outdoor playground area. Paid pediatrician. At meals : seats at the table, baby menu, baby food and bottle warmer. The prices of the price list are per person per day full board.